When Dictionary.com posted it as their word of the day on Jan. 23, I shrugged it off. Why explore this word? Doesn’t everyone know this? Little did I know that ‘homograph’ is a subcategory of ‘homonym,’ the word we always learned about. 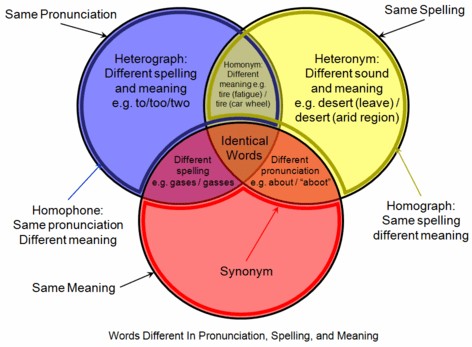 Ever since elementary school, I’ve been taught that ‘homonym’ means ‘words that sound the same but have different meanings.’ This is correct, but there are three kinds of homonyms that were never mentioned. It’s easier to remember the words by analyzing the Greek origins. ‘Homo,’ from the Greek ‘homos,’ means ‘the same.’ ‘Phone’ means ‘sound.’ Therefore, homophones are words that sound the same. They may or may not be spelled differently. These words have different meanings despite sounding the same. ‘Graph,’ derived from the Greek ‘graphos,’ means ‘drawn or written.’ Therefore, the word means something spelled the same way but has a different meaning. It may or may not have the same pronunciation. Examples: evening (smoothing out) and evening (after sunset), present (gift) and present (now) Here are more examples from DailyWritingTips.com. Heteronyms are homographs that definitely have different pronunciations. As you can see, the words are all connected. 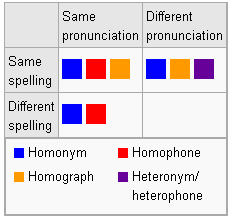 Heteronyms are homographs. Homographs are homophones. And they are all homonyms. Here’s a graph found on DailyWritingTips.com credited to Wikipedia. Also, the ‘homonym’ Wikipedia page presents an interesting graph if you have a few minutes to study it.